When classes begin at the new Collaborative Life Sciences Building (a PSU/OHSU joint venture) in South Waterfront, students will be greeted by not one, but TWO large-screen transit appliances in the building. The building atrium is cavernous. The screen is taller than my daughter – 80″ inches on the diagonal I believe (our biggest ever) – but still looks small in the space! Transportation between the building and the PSU main campus will be a bit constrained this year (next year MAX will carry a lot of the load), so information about Streetcar arrivals is important! Research out of the University of Washington shows that information tools that let riders know when the next bus is coming reduce perceived wait time compared to not knowing when the vehicle is arriving. Transit agencies can give customers improved satisfaction without major investments in additional service. 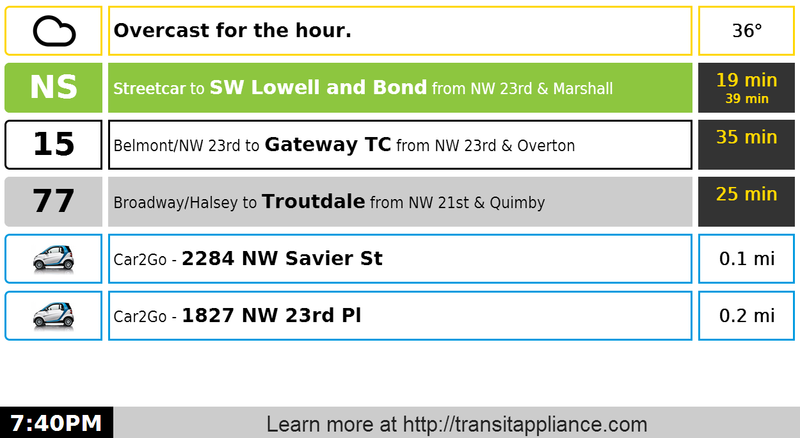 Now I’d never say that TriMet shouldn’t keep improving service, but would anyone care for a Transit Appliance? 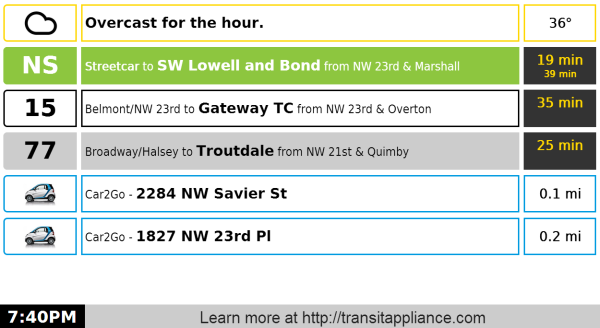 I usually have some free time around the holidays, and like to use it as an opportunity to advance the Transit Appliance project. This year that looks like adding weather as an option to the display. Want to know if you need your umbrella when you run for the bus? We’ll tell you. The widget is based on the forecast.io API, and we’re using the feature that provides a forecast for the next 60 minutes. You can position the widget either the top or the bottom of the list of arrivals. Because this is a commercial API (and the key needs to remain confidential), if you’d like it on your appliance we need to work out a few details. Just let us know. 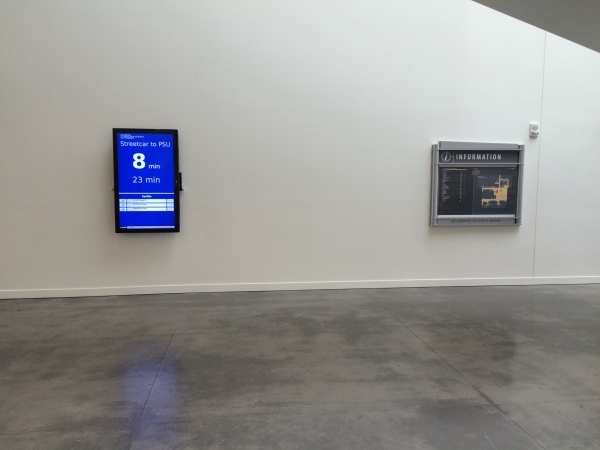 As a provider of arrivals displays, Portland Transport is a happy organization today.